Is it OK for spy agency chiefs to tell the truth? 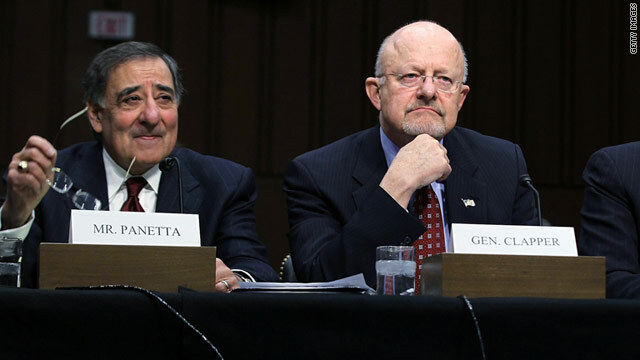 CIA director Leon Panetta, left, and Director of National Intelligence James Clapper testify before a Senate committee in February. Editor's note: Gen. Michael V. Hayden was appointed by President George W. Bush as CIA director in 2006 and served until February 2009. He also was director of the National Security Agency and held senior staff positions at the Pentagon and is now a principal with The Chertoff Group, a security consulting firm. (CNN) -- So, Jim Clapper was right all along! Remember the stir that the director of national intelligence caused four short weeks ago when he offered this analysis on the situation in Libya: "I just think from a standpoint of attrition, that over time, I mean -- this is kind of a stalemate back and forth, but I think over the longer term that the regime will prevail." Within hours, National Security Adviser Tom Donilon was on a conference call with reporters repudiating Clapper's analysis for not being informative and charging that it was neither "dynamic" nor "multidimensional." It looks as if the DNI's statement had put the Obama administration on a spot that it was not yet prepared to be on. But a week later, NATO airpower was called on to stop the Gadhafi regime from overrunning the rebel stronghold of Benghazi and snuffing out the revolt in its birthplace as it looked like the regime was about to, well, "prevail." The episode is instructive. First of all, no chief of any other intelligence service on the planet would have been asked that kind of question in open parliamentary session. It is incredibly difficult for the DNI to comment publicly on such a situation, knowing that his comments will actually affect the situation. But such is the American system of transparency and oversight. We often play things out in public that others keep private. Second, the reflexive White House repudiation of the analysis, by what statute says is the president's senior intelligence adviser, surely sent a shock wave through the American intelligence community. Most analysts would have agreed with Clapper and been disheartened to see how their policy masters responded to these "unpleasant facts." They would have also been discomfited by the DNI's spokesperson later in the day seeming to align the DNI with the White House, commenting that Clapper's testimony was a "snapshot" of a "very fluid" situation with "many factors (that) will come into play over time." Beyond these analytic specifics, though, the DNI has a bigger issue. He needs to run the American intelligence community, and the law establishing his position is more than a few bricks shy of the load he needs to do it. To make up for what the statute lacks, DNIs have had to rely on the informal power created by a close relationship with the president and the White House. Fortunately, the DNI got a public vote of confidence from the White House even as his analysis was being belittled, but he cannot stand many such episodes. There is a final, and perhaps even more important, concern. Years ago, when I was an ROTC instructor, an early bloc of instruction dealt with communication skills. Near the beginning of the unit, I would quote Confucius to the cadets: "The rectification of names is the most important business of government. If names are not correct, language will not be in accordance with the truth of things." The point had less to do with communicating than it did with thinking -- thinking clearly. I sometimes fear that the real and perceived demands of public discourse -- and of political correctness -- distort our language and threaten to distort our thinking. Admittedly, some of this amounts to little more than comic relief: White House press secretary Jay Carney's description of Libya as "a time-limited, scope-limited military action" rather than the more accurately descriptive "war" ranks right up there with "overseas contingency operations," a term that has been suggested by some officials as a replacement for George W. Bush's "war on terror." And recently there were more than a few wry smiles in the White House press room when Carney declined to answer a question as to whether the administration's prohibition on "boots on the ground" in Libya included boots with CIA feet in them. But there are distortions with more serious consequences. The reluctance to label as "terrorism" the Anwar al Awlaki inspired killings at Fort Hood, Texas, by a self-described soldier of Allah comes to mind. So, too, does the original description of Umar Farouk Abdulmutalab, the suspect in the botched attempt to bomb an airliner landing in Detroit, as "an isolated extremist." The painful two-minute debate over the use of the term "radical Islam" between Rep. Lamar Smith, R-Texas, and U.S. Attorney General Eric Holder at a Judiciary Committee hearing in May provides plenty of evidence that we have yet to arrive at a consensus on the "rectification of names." As director of the National Counterterrorism Center, Mike Leiter probably faces this particular dilemma more then most. You can see in his words an honest attempt to accurately describe reality -- "you cannot separate out the fact that the terror fight we are fighting today involves Islam as a religion" -- while being careful not to slip into inaccurate and overly broad condemnations -- but "the ideology which motivates these terrorists has very little to do in reality with the religion of Islam." At a recent public conference, Leiter added this assurance: "I can tell you that in the work we do, there is no PC-ness." That's closer to the rectification of names I used to tell my students about. Its closer to letting the evidence take you where it may, just as Jim Clapper did in his testimony. Public officials need to choose their words carefully, but we should not be so timid that our language confuses everyone -- including ourselves. The opinions expressed in this commentary are solely those of Michael V. Hayden.